Dead Canaries Don't Sing is a fun detective novel featuring vetenarian Dr. Jessica Popper. She lives with her menagerie of pets, dogs Lou and Max, her cat Catherine the Great (also known as Cat), and her parrot Prometheus in their eastern Long Island home. On her way to visit a sick horse, but on the way, her dogs discover a body. Strangely, next to the half buried body, she also finds a dead canary. The cops don't seem interested in investigating the murder, and for some reason Jessica never really manages to explain, she feels driven to solve the murder herself. Using her profession as her pretext, she invents reasons to interview all those close to Tommee Frack, the murdered victim. It turns out that he was in the public relations business, and had amazing success, so he knew many people. Jessica has a great talent for winning people's confidence but she starts to get worried when her elderly neighbor Betsy starts to get threatening messages. Factors like that make her decide to ask for the help of her ex-boyfriend Nick Burby, himself a private investigator. But feelings between Nick and Jessica become complicated and her own life is at risk. Author Cynthia Baxter tells her story with straightforward cheerful simplicity with an undemanding plot. 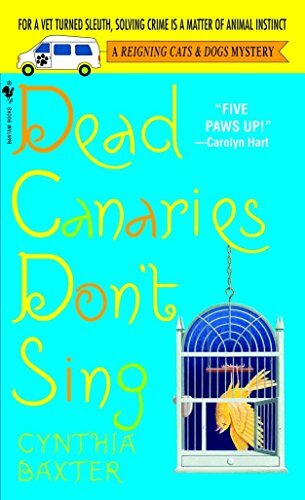 Dead Canaries Don't Sing is a satisfying read, and should especially appeal to animal lovers and residents of Long Island. It has no pretensions to psychological depth and the pages turn quickly.